Electronique.it have been celebrating their 10th anniversary / 200th podcast with a series of mixes from the cities that have influenced them the most – New York, Chicago, Detroit, Den Haag, and, of course, Rome. Dozzy was given the difficult task of representing his home town and telling the history of a city that has played an important – if perhaps under-appreciated – part in the development of techno music. Dozzy put a huge amount of time and effort into this mix, and the end product is just as good as you’d expect. 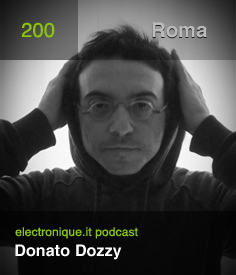 Donato has essentially done something similar to Hawtin’s DE9 Transitions mix, but using only source material from Roman artists. He takes elements from 55 tracks covering the period between 1972 and 2013, including everyone from the most famous Roman producers to some of the lesser known and newer names. Over the years one of the trademarks that Dozzy has developed is the incredible amount of care that goes into his work – whether DJing, playing live or producing. The nuance – that extra bit of thought – is one feature that really distinguishes and defines Dozzy’s genius. This mix is another example of these traits on full display. I strongly recommend you take the time to read his statement about the mix and then wait until you can find the time to give this recording the time and attention that it deserves. Kudos to Dozz for stepping up once again, and to Ivo and electronique.it for an impressive 10 years.